The unique feature of the portfolio is that the composition of stocks depends on whether the investor wants an “aggressive”, “balanced” or “conservative” portfolio. In the period from 20.11.2013 (inception) to date, the “balanced” portfolio has given a return of 13.2%, the “aggressive” portfolio has given a return of 10% and the “conservative” portfolio has given a return of 10.02%. In the same period, the Benchmark (BSE 500) has given a return of 4.6%. The other noteworthy point is that three stocks, Mastek, Aurobindo Pharma and DCB, which have given bumper returns in the short period have been removed from the portfolio and replaced by more promising names. Daljeet Kohli’s Stock Pick J. B. Chemicals Is On The Move. Do You Have It In Your Portfolio? Will Daljeet Kohli’s Latest Stock Pick J.B. Chemicals Also Give Multibagger Returns? 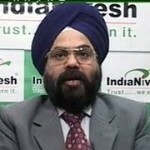 I love to hear Daljeet singh kohli’s honest and unbiased transparent advice on the stocks.God bless him. I wish to join Indianivesh for tips in equity future. sometime I listen about your pick and get very good result.